July 4th is a celebration for America. 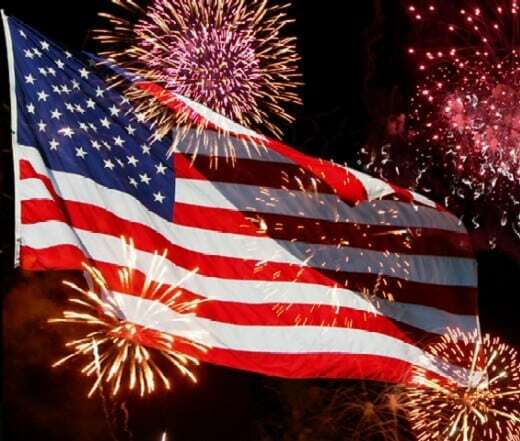 It’s on July 4th that we as a nation celebrate Independence Day and as is customary during celebrations, we rejoice with food and fun and (yes) drink. July 4th cookouts and picnics are tradition for most Americans and that includes booze. Even the most responsible social drinker will often throw back a couple drinks on July 4th. It’s summertime, it’s hot outside, the beer is cold and they’re amongst good friends and family. July 4th is the time to have a few drinks, relax with good company and watch some fireworks. However, for those people that are newly clean and sober, celebratory events like July 4th can be uncomfortable or even dangerous occasions. Temptation looms at every event and often it can seem to be difficult to attend July 4th events. However, this doesn’t have to be the case, nor should it be the case for someone new in recovery. Being in recovery from addiction or alcoholism does not mean shielding yourself from temptation or avoiding events like July 4th parties. Being in recovery means being able to attend these occasions without worry that you may be tempted to drink or get high. Being in recovery means entering into these situations with a plan, a program and the comfort in knowing that you are safe and protected from what might look to the outside world as temptation. It also means not having to have a dull or somber July 4th, but rather being able to enjoy the festivities and have fun like everyone else. BE PREPARED. You know what July 4th parties are, so be prepared for what you are getting into. If you are still in treatment, speak with your counselor or therapist to prepare. If you are out of treatment and involved in a 12 Step fellowship, talk with your sponsor or other sober supports. Inquire as to how they handled themselves in similar situations when they were new in recovery. Use that advice or experience and carry it into your own life. BRING SOMETHING TO THE OCCASSION: Instead of worrying how you will be affected by the party or how you’ll feel when others are drinking, try to bring an unselfish attitude to the situation and where you can be helpful. Remember: our friends and family should not have to change their behaviors because you are in recovery. Sure, maybe Grandma might want to think twice about hitting that crack pipe in front of you, but overall we shouldn’t expect friends and family to stay clean and sober because we have to stay clean and sober. Try to see where you can help in planning the party or setting it up. Maybe there is a friend or a family member having their own struggles with addiction. You can lend an ear or discuss your experience in recovery. Try to see how you can increase the fun others are having instead of sitting on the sidelines because you can’t drink. IF NEED BE, MAKE OTHER PLANS: Sometimes being in recovery means you have to be an adult and if you truly don’t feel comfortable attending a party, tell your friends and family that you can’t go. In this case, you can “just say no”. Sometimes situations are just too dangerous and uncomfortable in early recovery and the best plan is to avoid that situation for the time being. Make other plans. Call clean and sober friends and make plans with them. Often local AA and NA groups hold events on July 4th, so attend a sober BBQ where you can have fun with others in recovery. If the July 4th party is too difficult to attend, then recognize that and understand what the simple solution is: don’t attend and make other plans. Being new in recovery, there will be a lot of uncomfortable situations that you encounter. Holidays like July 4th where drinking and drugging is more open and accepted certainly are one of those situations. So be prepared, bring an attitude of helpfulness and usefulness to the occasion and, if the situation is just too difficult, make other plans. Remember, recovery offers us freedom from addiction and alcoholism. It allows us to live happy and clean and sober. However, sometimes that can take some time and if you are so new to recovery that you are concerned about a July 4th party then take the suggestions above. Recovery is supposed to be fun. Don’t worry about being sober on July 4th, just don’t be somber on July 4th. Talk to your counselor, your therapist, your sponsor and your sober supports and remember that millions of people will be sober while celebrating Independence Day and you are one of many. Many people are celebrating their own freedom from active addiction this Independence Day. You are not alone.